With 2017 drawing to a close, it occurred to me that I have been remiss on discussing the reinvigoration of the “Army’s Navy” with the award of the Light Maneuver Support Vessel (MSV(L)) building contract. I have also been remiss in highlighting the winning prime contractor, an “on-the-move” multi-state industrial conglomerate called Vigor Industrial. Under the leadership of the strategic-minded Frank Foti, Vigor did a great job of putting their MSV(L) “win” together, making Vigor a critical Army partner. If the MSV(L) helps the Army look up a bit from their land-war-in-Eastern-Europe scenarios and continue to get serious about the Pacific, Vigor’s new program could be in for a really interesting ride. Now, as a program, the MSV(L) has been locked in a textbook “orphaned” and “too small to be popular” death spiral for years. Coming along just as the Army was doing everything it could to divest/defund their odd-lot logistically-minded Navy, the Army took more than a decade to get MSV(L) awarded–to give you an idea of just how painful this “simple-system” acquisition actually was, the Army released at least three RFIs for this program between 2002 and 2012 before finally translating a third RFI into the actual solicitation Vigor won (and yes, I probably missed a few RFIs). Put in perspective, that’s…well…that’s more programmatic “solutions analysis” than the Navy’s new Frigate program is getting! 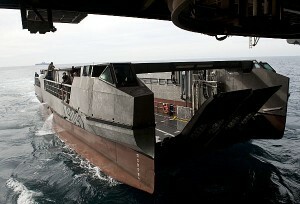 For all of you Navy-types unfamiliar with the MSV(L), the MSV(L) is a landing craft. You know, a ship built to run aground (yes I know, this is a sensitive topic for SWOs right now, and I’m sorry). 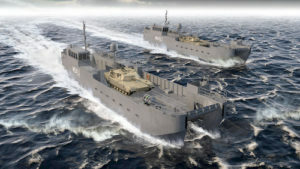 When fielded, the new MSV(L) will replace the Army’s old and creaky LCM-8 “Mike” boats with up to 32 far (FAR) more ambitious landing craft–the MSV(L)s will be bigger, heavier, and (possibly) mount some impressive sensors and strong seakeeping capes. As such, the MSV(L) has a lot of very interesting potential. Overall, as a generic platform, the MSV(L) checks a lot of interesting boxes. 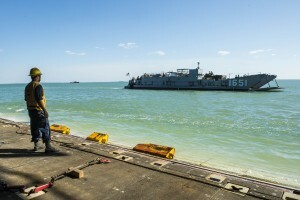 Not only does this craft position the Army to operate in the Pacific, but it positions the Army to possibly play in the Navy’s sandbox of distributed fires. The future of the MSV(L) will depend upon a successful building and design team. And to the program’s credit, Vigor started quietly putting all the MSV(L) pieces together years ago, and ended up surprising everybody with a really formidable solution and team. Vigor’s team pushed aside popular designs and strong competitors like Bollinger, Textron and Marinette Marine. Well, first, Vigor got the yard mix right. In early 2015, Vigor bought and turned around Kvichak Marine Industries, a dying aluminum/small boat/landing craft specialist yard. At the time of the acquisition, Kvichak was out of gas, with no immediate prospects in sight as it finished up deliveries of the last of the Navy’s Maritime Prepositioning Force/Utility Boat-40 LCMs. With deliveries of those boats ending in late 2013/early 2014, Kvichak made a hail-Mary play for a big Army buy of up to 379 Bridge Erection Boats, lost it, and then delayed the program for six months with a protest that was denied in March 2014. But Vigor stepped up, gave the aluminum/small boat specialist a lifeline and also (in my opinion) “rehabilitated-by-takeover” the yard’s relationship with the Army. Second, Vigor got the right design. Out of the handful of “advanced” landing craft designs out there, Vigor drafted BMT for what looks to be a variant of their Caiman 90 Fast Landing Craft. I’ll talk about the strength of the design below, but, in my opinion, the Caiman 90 was a pretty low-risk option out of the array of interesting (and quite highly-promoted) contenders. Third, BMT knew competing technologies backing alternative designs. 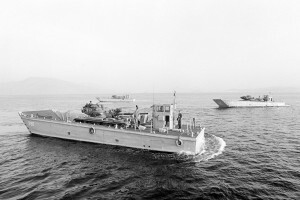 BMT was a player in a prior UK attempt at a hybrid surface-effect landing craft called the PASCAT, so the Vigor Team was ready to cast aspersions upon Textron’s PASCAT-like offering. In addition, Vigor was well-positioned to kick dust on the early design favorite, the CNIM L-CAT. The L-CAT is a convertible catamaran (the deck moves up and down converting from a catamaran to landing craft), offering excellent seakeeping, self-deployment capabilities and good speed in exchange for a more complex platform. This concept–which is, admittedly, an elegant and scalable solution–is in service with France and is likely to be developed for Japan and other countries. Decades earlier, Lockheed promoted this type of platform in the United States, and helped Vigor Industrial build the ultimately unsuccessful and awfully pricey ($85M +!!) M/V Susitna—an ABS-classed, ice-hardened ferry—as a test-bed (an aside: anybody know how Susitna is doing in Philippines service?). At any rate, Vigor likely knew all the L-CAT design’s weaknesses–a great advantage when writing up the solicitation (of course, a poorly-timed L-CAT casualty off Guam probably didn’t help either). Finally, Vigor had some really interesting partners. They tied on a yard in Massachusetts–Gladding-Hearn/Duclos–a best-of-breed niche shipbuilder that strengthened Vigor’s already formidable cadre of Congressional support AND shipbuilding know-how. And the ability to have Vigor’s political influence (if not work in support of the MSV(L) contract) distributed across several Western states–Washington, Oregon and Alaska–as well as Massachusetts–exploited the advantages of a widely-distributed (but not over-diluted) manufacturing footprint that Marinette, Textron or even Bollinger (which really should have been more strongly integrated into the wider Edison Chouest Offshore universe by now) just couldn’t match. The international “Special Relationship” angle also helped; given the vicious cuts that had been proposed for the Royal Navy’s amphibious fleet, a timely win for Vigor’s British Teammate (BMT) helps preserve an endangered nucleus of amphibious design expertise for America’s British partners. Vigor also grabbed Northrop Grumman as a partner–probably just to leverage Northrop’s UK subsidiary, Sperry Marine–for basic systems, but…with Northrop playing in the LCS Mission Module area, the potential to offer some additional “systems integration” of, say, oh…”weapons systems aboard other embarked platforms” mustn’t be denied. As noted above, the BMT Caiman 90 beat the L-CAT–a big surprise for anybody watching this competition. The L-CAT is a convertible catamaran, offering excellent seakeeping, self-deployment capabilities and good speed in exchange for a more complex platform. Marinette Marine grabbed the L-CAT and was an early favorite–Personally, I like the platform–and a big, scaled-up set for technically-proficient and maintenance-focused Japan would be a great fit. But ultimately the L-CAT–in the size proposed–was not a viable contender for the MSV(L). The writing was on the wall–the Marines, as of 2014, seemed uncertain if the French version could support an Abrams. (Advocates kind of forget the L-CAT was built for the AMX LeClerk—one of the lightest modern MBTs in the field today at about 60 tons.) Scaling L-CAT up while incorporating the various classification demands (ABS pauses, looks up from it’s usual work of demanding various waivers for cash, waves, says “hi!”) posed a real risk. I presume the Bollinger design extended the yard’s deep relationship with Damen. And while Bollinger has amply demonstrated that it can build Damen build-to-print designs, and Daman designs have repeatedly demonstrated their merits, Damen’s landing craft designs were still little more than general arrangements. Textron offered an innovative design with surface effect features. But, again, the Navy’s repeated explorations (and ultimate rejection) of surface effect vessels AND the relative immaturity of the design likely posed serious barriers. But again, the design agent for the Vigor Team had helped design the surface-effect oriented PASCAT landing craft, so AGAIN, Vigor was probably well-armed with juicy real-world information on the likely operational weaknesses of the Textron bid. I like the Caiman 90 because it may have a real capacity to fight the cargo. The drawings are a bit obscure, but it does look like operators could, in a pinch, fire an Abrams main gun over the gunwales (as could be done with the M60 and the LCM-8). Or a TOW from a Stryker or a short-range anti-air missile from…something. The late Oct Marine Corps experiment of firing a HIMARS missile from an amphib should offer an idea of the potential here. Add in some basic integration–so the ship and the embarked cargo can share data–and suddenly there’s some neat opportunities to integrate Army capabilities into a wider net–be it an Abrams main gun, MLRS, short-range anti-air, or other stuff. And yes, everybody knows there are some serious challenges operating Army systems at sea, but, hey, if Big Army really wants to play in the oceans, those issues need to disappear, pronto. One way to mitigate the challenges of operating at sea might be to leverage Northrop Grumman’s participation in the MSV(L). Any prospect of tying into some of the littoral combat ship mission modules might offer an interesting opportunity to use Navy tools aboard the MSV(L) at sea. Or, conversely, if Army wants to leverage it’s tools at sea, the old MSV(L) organic sensor objectives/thresholds were roughly in line with the range of the M1A2 Abrams tank main gun and/or the BGM-71 TOW missile…so you can see where a Northrop Grumman-mediated integration of an embarked Army weapon into the MSV(L)’s marine-hardened sensors might be quite useful. My sense is that the requirements for the platform hinted that the LCU will be in the fight—the organic self-defense mechanisms were, at an early stage, far stronger than most—if not all–peer landing platforms in service today. Until recently, that sort of gritty realism about future battle environments was relegated to only a few dark corners. But there’s still a ways to go–hopefully the vessel will be sufficiently hardened to operate in the ugly and messy battlefields of the future. Now, the promotional materiel released on the Caiman 90 design suggests that the vessels can be operated safely in seas of up to Sea State 4 and operate at up to 40 Kts. Boasting a 500 nautical mile range (but at what speed and load, I wonder? ), the vessel is mobile enough to move about the Deep Pacific. The advertized mobility is nice, but I’m still not particularly happy with the berthing and endurance arrangements, and hope that this platform will boast sufficient range/endurance/berthing to support longer-distance operations or transits. I’m concerned about this as I suspect that the displacement of the MSV(L)s will make it difficult for the landing craft to interface with existing lift–you’re not going to see the MSV(L) bolted down to an Army transport ship for long trips or nesting in an amphib’s well deck. It’s just gonna be too big and too heavy. Maybe MSV(L) mobility will be something for the Navy’s two Expeditionary Transport Docks (ESD 1 and 2) to support, but…who knows? My fear is that the platform will continue to grow–ending up too heavy and too short-legged to support future work in the deep Pacific. The MSV(L) is a much-needed platform that deserves more attention than it has earned to date. The platform is a fascinating combination of a much-needed, relatively simple logistical support platform and a pocket shooter. It could, in a pinch, have a nifty role in the distributed leveraging of America’s vast array of shooters throughout the world’s littorals. I’m glad this low-profile program is underway. Some may scoff that the MSV(L) is a just a gold-plated landing craft for a service that doesn’t know any better, but I have high hopes. It’s a solid design with some neat opportunities for experimentation. And, while there are some operational and design risks–weight, range, endurance–the MSV(L) seems set for success with a strong design, a strong team and good Congressional support. Which, well, may combine to influence the Navy’s LCU 1700 recapitalization program in some very interesting ways.